The Catalog & Compliance tab enables you to upload your catalog plus any certification and compliance documents. You can add catalogs by uploading a file from your computer or linking to an online catalog. First, type the title of the catalog in the Catalog Name box. If this catalog is safe for end buyers (meaning it has no supplier information or net cost information), check the End buyer friendly box. Use the dropdowns to select start and end dates for this catalog to be displayed on ESP. 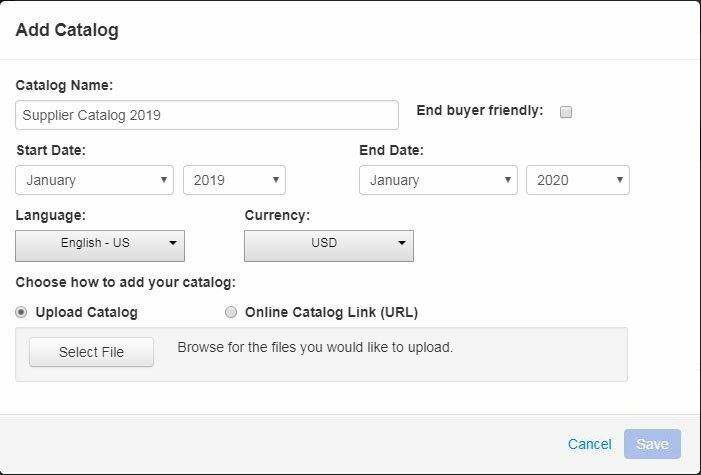 Choose a language and currency for this catalog using the available dropdowns. Then, upload or link to the catalog. After adding the catalog information, choose to upload the catalog or link to an online catalog. To upload a catalog, choose the upload option using the radio button and click on the Select File button. Browse your computer, locate the catalog file you would like to upload, and click on the Open button. Files must be a PDF, .XLSX or .DOCX. The name of the catalog file will be displayed with an Upload button. Click on the Upload button. The catalog will appear in the Manage Catalogs area. To link to a catalog, choose the Online Catalog link option using the radio button. Enter the URL and click on the Add button. The catalog will appear in the Manage Catalogs area. In the Manage Catalog section, you can click on the Edit link to change the Catalog Name or use the "X" to delete the catalog. If you need to update or modify the URL, click on the Edit link. Type in your changes, and then click on Save link. If multiple catalogs have been uploaded, to change the order of the catalogs, click on the icon with the three horizontal lines and drag them to a new order. Just as with catalogs, you can add Safety & Compliance information by uploading a file from your computer or linking to an online document. First, type the name of the document in the Document Name box. To upload a document, choose the upload option using the radio button and click on the Select File button. Browse your computer, locate the file you would like to upload, and click on the Open button. Files must be a PDF, .XLSX or .DOCX. The name of the catalog file will be displayed with an Upload button. Click on the Upload button. The document will appear in the Manage Documents area. To link to a document, choose the Online Document Link option using the radio button. Enter the URL and click on the Add button. The catalog will appear in the Manage Documents area. 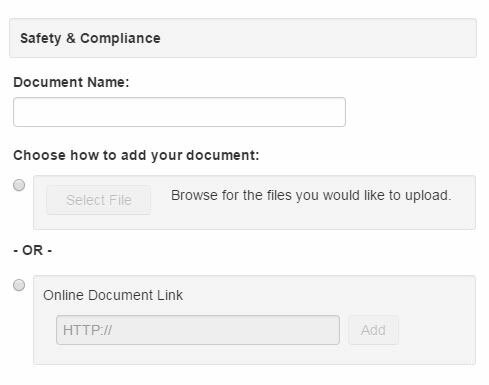 The name of the document will be displayed with an Upload button. Click on the Upload button. The document will appear in the Manage Documents area. To link to an online document, type the name of the document in the Document Name box. Then, select the Online Document link option using the radio button. Enter the URL and click on the Add button. The document will appear in the Manage Documents area. In the Manage Documents section, you can manage previously added or linked documents. For linked documents, there are two Edit links. The Edit link next to the "X" enables you to change the Document Name. To update the URL, use the other Edit link. For uploaded documents, use the Edit link to change the Document Name and the View Document link to preview the document. Use the "X" to delete the document.